Appropriate business etiquette is expected of all professionals, especially at corporate events. Few individuals are trained in the art of good manners, particularly for work-related settings. As a result, most people learn meeting etiquette and how to conduct themselves at business events on the job. Behavior that might not be an issue outside of the corporate world could affect professional relationships and even damage careers. 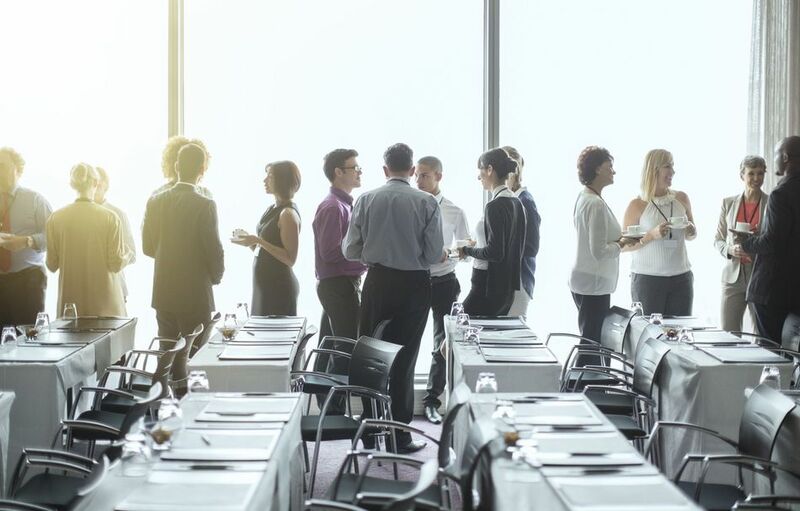 A corporate event may be a more relaxed setting, but it is still grounded in the ethics and principles of the business environment. Not everyone is completely at ease with the idea they may be judged by whether they exhibit proper business etiquette when dealing with corporate hosts, colleagues, and other guests. Keep in mind, though, that the purpose of etiquette is to create an environment that allows everyone to feel comfortable and professional at the same time. Invitations provide most of the important information about an event, including details about the host, type of event, purpose (even as much as a brief agenda), location, time, specific instructions, and—of course—the RSVP. Events may rely on a variety of RSVP options, including email, phone, mail-in cards, and more. Guests should respond quickly when they receive an invitation, and it’s best to respond within a week. If you must decline at the last minute, please notify the host prior to the event or first thing the next day with sincere regrets. Some events and venues may advise other casual wear, such as golf, tennis, horse racing, resorts, and so on. Organizers are usually specific about attire requirements. The event host spends significant time and resources to plan and execute an event, so most people know the answer to this question: Be on time. If you are a representative of the host, the answer is that you should arrive up to 30 minutes early (you will be given a time; show up when requested). If you are a guest, understand that the organizer has been selective with the invitation list. Many invitations include a brief agenda that highlights when guests may arrive for the event, typically providing a window of 15 to 30 minutes for registration and welcome reception times. Also, stay as long as possible or to the conclusion of an event. When Should You Extend a Handshake? Always shake hands upon arrival and departure. This is an easy rule that few people violate. Greet everyone with a sincere handshake and direct eye contact. However, when approaching a group of individuals, guests should always shake the hand of the host first. Of course, in some scenarios, handshake greetings aren’t possible, such as when both hands are full. In those situations, either party may nod or use another gesture to convey the greeting. How Should You Introduce People in a Group? Introduce lower-ranking individuals to higher-ranking individuals. Remember to include titles (e.g., Dr., Judge, etc.) or a name prefix (e.g., Mr., Mrs., Ms.). It’s important to have strong listening and conversation skills in group situations. This means not interrupting, maintaining open body language (stand or sit up straight, don’t cross your arms, and maintain good eye contact), and showing interest in what others have to say. Contribute to conversations by being able to speak to a variety of subjects. Find topics of mutual interest and avoid correcting what others have to say. Make sure to involve everyone in the group in the discussion, not just one or two people. Encourage people to talk about themselves, and be graceful when providing or accepting compliments. It’s unfortunate to add the following, but necessary for some: avoid the use of foul language and the wrong types of slang in conversations. What Shouldn't You Talk About? When Should You Defer Extra Courtesy to Others? Follow the lead of others (e.g., the host) to know when and where to sit. Don’t assume empty seats are available. Allow others to take the better seat. Wait to speak until others acknowledge you. Wait for the host before taking the first drink. Wait to eat until after everyone is served and the host has begun. Research the event topic and venue before arriving. Never drink more than two alcoholic drinks. Allow the event host to make the first toast. Notify hosts of any dietary restrictions prior to an event. Understand how to use flatware: eat outside in. Glassware is placed to the right. Bread plates will be placed to the left. Place the fork and knife in the four o'clock position when finished. Place napkins on the chair seat or arm when briefly stepping away. Thank the host in person prior to leaving. Send a thank-you note to the host within a week.